Thinking of a hairstyle for men, the first thing that comes in the mind is the short haircut only. However, there are different styles of hairstyles available for men these days. But to get the versatile look, short haircuts is all that a man needs. When we say short haircut, people feel that there are not many styles and varieties to explore in male short haircuts. But this is not the truth, as we have more than 20 or 30 hairstyles for short hair for males. Short haircuts are preferable also, as they are easy to manage, and they will not need a lot of maintenance. However, if you would like to go on with the look. You need to get the haircut done from time to time to maintain the look. We have selected some of the best hairstyles for men for this season, which we have listed below. You can check those hairstyles and can try the one you like the most. If you will look at this hairstyle, you may get confused at first go. But if you will notice it closely, you will see how beautifully the hair dresser has summed up three different hairstyles in one. With a slightly high twirled pomp at the front and low long hair at back, this style is looking awesome. 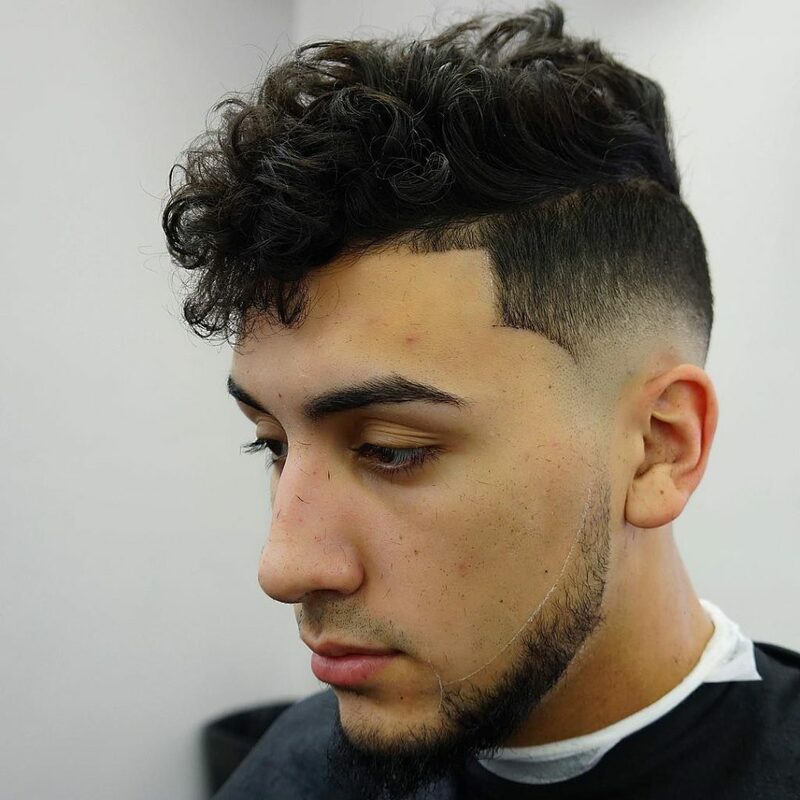 Keeping the hair around the neck and the back shaved and while moving upward the faded hairstyle is given at both the sides. Do not miss the highlights at the top with a light blonde color on the brunette color hair. For all the men who have thick and wavy hair, trying this hairstyle is a must. As this hairstyle can only be suitable for men who have natural wavy and thick hair. Keeping the side low by giving it a blurred cut look. And adding the volume to the center with the textured hairstyle will make you look classy. To maintain that classy look, you can add a very small quiff. If you are pro at making hairstyles, then you will be able to do this hairstyle easily using your fingers and a little bit of hair gel. As we said that we have some of the other hairstyles for everyone. So, here we are with a hairstyle for men with short and frizzy hair. And in case you do not have frizzy hair, still, you can get this look easily by using hair spray. A nice texture is created at the top using the fingers by messing up the hair. The hair is cropped in an edgy way, giving a frizzy and wavy both look if you will notice closely. For a college-going guy or for a party look, you can try this hairstyle. Bringing a twist to the version of flattop hairstyle by giving a softer and curvy look to the hair at the front. This makes the hair look full of volume. Go for the faded style for the sides, so that the top can get the full highlight. Also, you can highlight your front hair using the combination of light and a dark color. You can go for black and blonde or brunette and blonde also. With light beard and mustache like the one in the image, this look is perfect for any place, be it your college or your workplace. Don’t be surprised to see this hairstyle, because many people consider it in the long haircut. But it comes under the short haircut style only. The top hair is kept relatively long. The hairdresser has styled the hair by making them fall to the front side adding the fringes one above the other. But the hair at the back is kept short in comparison to the front hair. And side hair is done with the fade cut look in slanting fade style going from the front towards the back. The wavy medium size beard is looking awesome with this look. It is giving a look of an artist. Are you fed up of your thin hair and not being able to make a perfect hairstyle? If yes, then stop getting furious over your hair and check this hairstyle. This is designed especially for men with fine hair so that their hair can look voluminous. The hairdresser has summed up this hairstyle using 4 different hairstyles. Starting with the slight fade on both sides, to make the hair look voluminous. And then styling the hair by giving it a pomade style along with a spiky quiff. The hair at the back is also being messed up to give textured look for giving volume. This is definitely a time taking hairstyle but will look great. The trend of keeping more hair at the top and keeping less hair at the side is not at all new. But how you can keep it that matters. Just like in this hairstyle, the top hair is kept long and wavy, which are giving the look of the normal wavy hair. Especially, those on the top front above the forehead, are giving a great look. And the side hair is kept shaved. Those who have a light beard or no beard, this look will suit them. This hairstyle somewhere looks like the buzz hairstyle. However, it is not exactly the buzz hairstyle but is given a look similar to that. The hair is cropped very short at the front. And the hair at the back is shorter than those in the front. Side hair which is above the ear, they are given a blurred and faded look. For a professional look, this hairstyle is a perfect hairstyle. Also, it is one of the easiest hairstyles when it comes to styling, as one will not have to spend a lot of time in styling this hairstyle. Also, it does not require a lot of maintenance because of being very short. Quiff is something that you can make for both classy and a dashing look. Most of the men these days prefer to keep their side hair short or shaved. And that is what the hair styler has done in this hairstyle. Giving a high fade look with some style at the side. Bringing the wavy hair all in rows from back to front and making quiffs out of it. But it is not easy to do this hairstyle at home. Yes, these are short hairstyles only, but with a twist and that is why it is named as a short and high tall hairstyle. As you can see in the image, the hair at the side and back are very short and faded. But those at the top are raised high giving it a look of pompadour. No matter whether you have straight hair, wavy hair or curly hair, you can get this look anytime. All you will need is some hair gel and the wet hair. Just work on your hairstyle with your fingers, and you will be able to make this hairstyle easily. It’s been a long time when the slick hair came into fashion. And few hairdressers still use this hairstyle for people who have fine hair and who want to keep their hair short. People with fine hair have relatively low volume in comparison to other people with short hair. But with the help of slick style hair going right from the front to the back side, the volume is added because of the look. Keep the hair above the ears in the faded style. For an office look, this is the perfect hairstyle one can go for. We know that crew cut hairstyle is one of the favorite hairstyles of most of the men. But here we have come up with a better version of crew cut style. As we are keeping the fade a bit too high. Also, we are going to keep the length of the hair a little more than the one on the normal crew cut style. Even with the high fade, the hair at the top is adding volume. The pomp forming at the front in this hairstyle will make every man look stunning. Sometimes, you do not need a lot of styling to look good. As, with simple hairstyle also, one can look amazing. Just like the man in the picture. This is one of the simplest hairstyles we have mentioned here. Just so that it does not look lame and can look attractive, the hairdresser has cut side hair in the faded style. This hairstyle is easy to make and requires low maintenance. Do you like your hair to be really short? If yes, then this hairstyle is perfectly going to suit you. Many footballers have styled up their hairstyle in this way. Till the mid-way on both the sides, keep the faded hairstyle. And keep rest of the hair short except the front one. The front hair will be slightly longer and twirled at the front giving a look of a quiff. Be it the brown color hair or black color, or any other hair color shade, this look will suit all. Keeping back and center hair at the top very small. And leaving the front hair slightly long to make the style. You would have seen many actors copying this hairstyle. To make this hairstyle, you will also need hair gel, or hair spray, else, it will not be easy to carry this hairstyle for long. One needs to give a messy and spiky look to the hair at the front using the fingers on the wet hair. Keep the hair of both the sides short. Another short hairstyle for a male with thin hair. The side hair at the front is cut in the blurred cut look. And hair at the back is kept very short. There is a reason to keep the hair at the back and side short, as it helps in making the thin hair at the top look full of volume. 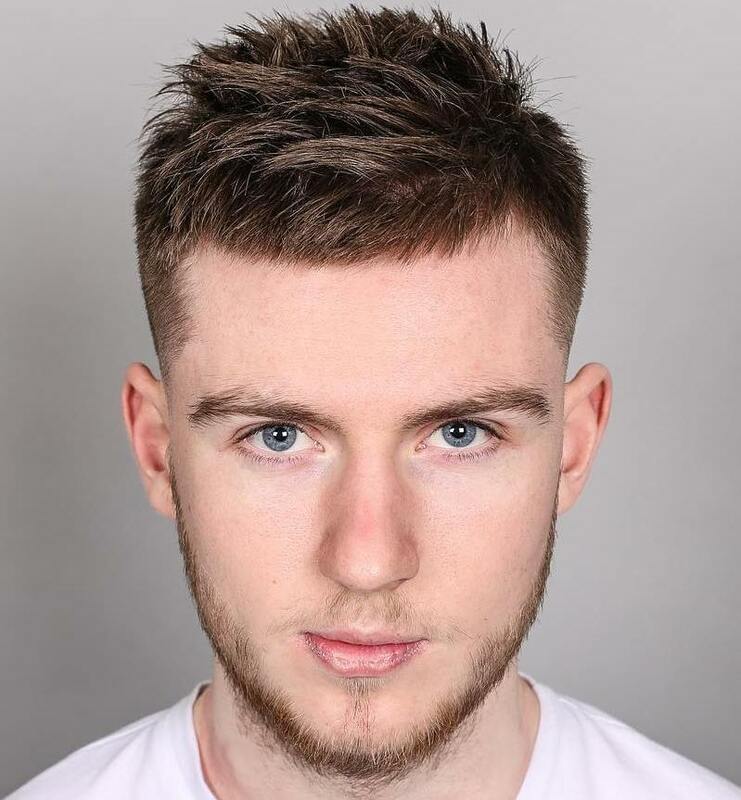 Making a slick going from left to side using the hairspray and a shining gel is making this style unique. You can try this look for any party. This hairstyle will suit on formal attires also. Another short haircut with textured hair look is here. But this is not a highly textured look or is not in the style of a pomade. The hairdresser has chopped hair small and has left them edgy. To give style to hair they are messed up without adding any height. They are giving a look of messy layered cut also. For any holiday, or for college or for any casual party, you can try this look. Can you tell exactly what is making this look unique and different? No, it’s not just the look, but the hair color used for this hairstyle is making this hairstyle look unique. The golden blonde color is looking awesome and stylish. The buzz haircut is new in the trend. You can keep it with short hair also and very short hair also. It is a type of haircut which will not make one look bald because of tiny hair. But it helps in adding volume to your hair, even if you have less hair or thin hair. Thick hair have a lot of volumes, and sometimes they look bulky and becomes a problem for styling the hair. But here, we are going to help you with a hairstyle for thick hair, which will not make your hair look bulky or heavy. Keep the hair at the back short and the front hair slightly long. With the help of a hair gel, style your hair and give them a textured look. Roll them in a way like in this image, that they can look wavy. This will cut the bulkiness and weight from the hair and they will look beautiful. If you love keeping your beard and mustache long, then go for this hairstyle. As this hairstyle looks beautiful with the heavy beard. This is a short haircut for a male with the tapper style. Generally, men like to keep their side hair and edge very short or trimmed. But these days it is a trend of keeping the tapper style. Along with the tapper style, part your hair from the side, and roll your hair flicks at the top to the other side. This will make it look like a pompadour. Do not forget to use the hair spray to make the look stable. 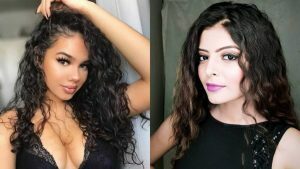 Be it a female or a male, if you have curly hair, it is not that easy to style them up especially when they are frizzy also. But these days, there are a lot of hairstyles available which you can try with the curly hair too. Like this hairstyle, in the image. However, this man does not have fully curled hair, but they are a mix of wavy and curly hair. The hairstylist has done a great job by adding the faded edgy look at the side. As this is highlighting the hairstyle more. At the top, the hairstylist has tried to give a messy textured look by making it in the pompadour style. The jet-black hair is looking very stunning especially, the faded cut part. This is not a new combination, but here when we say fade, we do not mean by fading complete side hair. We will keep the buzz look on with the stylish edgy buzz at the front. And fading the hair at the top of the ear up to a very small length. Because we have to show our buzz look also, so we cannot go for full side fade. Try to keep this look along with beard and mustache. You can style up your beard also just like your hair to get a rocking look. This hairstyle is a mix of two hairstyles, spiky and textured hairstyle. The lower hair at both the sides is trimmed short making a style at the forehead. Whereas the hair at the top and the center are messed up for adding texture to the look. The hair at the center, slightly close to the back are raised high giving them a look of spikes. However, they are not in the spiky form but are cropped in a way, that is making it look quite stylish. If you are thinking that, is this a style these days to keep front hair long and back hair short, then you are right. This is becoming a trend and it can be styled in different ways with different hairstyles. Here, the hairstyle at the top is kept in the textured form both at front and back. At the back the hairstylist has given the short-cropped hair look. And at the front, a long quiff is made using the long hair flicks. The platinum shade highlighted hair flicks are looking very stunning. Be it male or female, everyone faces the problem with the fine hair. As they do not show up volume of the hair and gives a flat look. But flat look also can be good at times, if you know how to make them look better. With this flattering hairstyle, keep the hair at both the sides a bit short. And let the hair at the top as it is. Mess the hair at the front just above the forehead a little bit, to add some style to the hair. Keeping side hair short, itself add the volume to the top hair. From the man in the 30’s or 40’s to the man in the 50’s or 60’s, anyone can try this style. We hope you like these male short haircuts which we have mentioned above. We have tried our best to list hairstyles which can suit different men as per their face shape and their age as well. All the hairstyles are different and unique, and you can carry them on different occasions as well. With these short hairstyles, there is a benefit that you can easily switch on to another hairstyle easily. So, you can try different hairstyles from the above-mentioned haircuts. Do let us know the one you liked the most.